It had been a while since I’d played Aliens vs. Robots. But nothing really bonds you with a group of complete strangers like strapping on a set of laser tag vests, running around in total darkness, and aimlessly shooting at people you’re not sure are your teammates or your enemies. So this was how I figured I’d make friends aboard Royal Caribbean’s new mega-ship, Symphony of the Seas. I’d been tracking this amusement park on the high seas for a while now, anticipating the unknown once it actually launched. 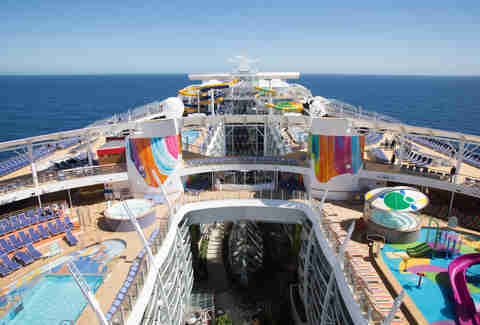 The new ship -- the world’s largest -- also boasts the world’s largest glow-in-the-dark laser tag arena. And as I found myself sailing alone I teamed up with a group of Chinese journalists, who spoke about as much English as I did Mandarin. We did find that the language of laser tag is universal, and as we stumbled around this massive, dark course together, shooting at whatever we could find, we laughed like kids. Then we did what new friends always do: tallied our kills together. D'awwww. Everywhere on Symphony of the Seas is this sort of simple, childlike fun. Whether you’re speeding down a 10-story slide, playing in a water park, riding a merry-go-round or watching robots with complete awe, this ship really takes you back. Except this time, there’s booze. It’s natural that the most ambitious, ludicrous cruise ship in the world is steering right into a youth trend we’ve been noticing for a while. Cruise ships still are the playground of 50ish travelers -- a demographic that has more time and the money to go galavanting around the ocean for kicks. 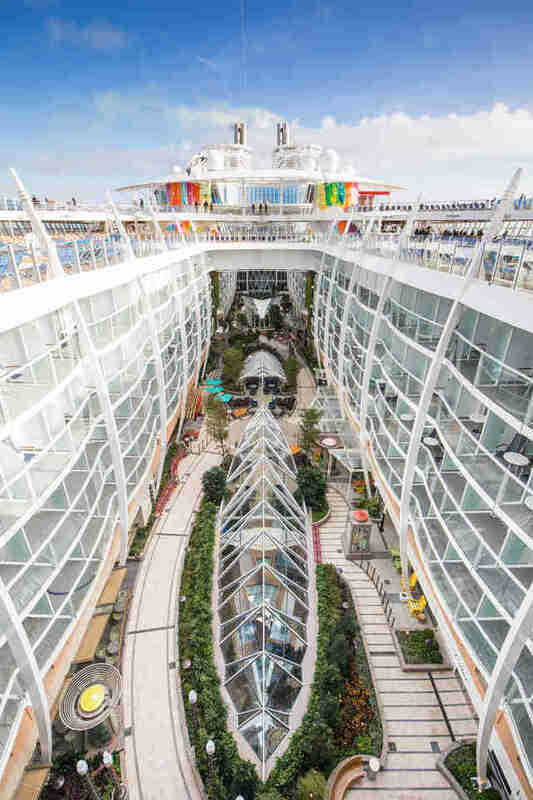 But as cruise lines engineer more and better features into their ships -- think go-kart tracks and rock-climbing walls -- they’re making more direct appeals to a younger, more spry crowd. This is partly why the average age of your fellow passengers on cruises keeps falling, especially on boats like this behemoth, built to appeal to 30ish travelers who still have more than a little spring in their step. 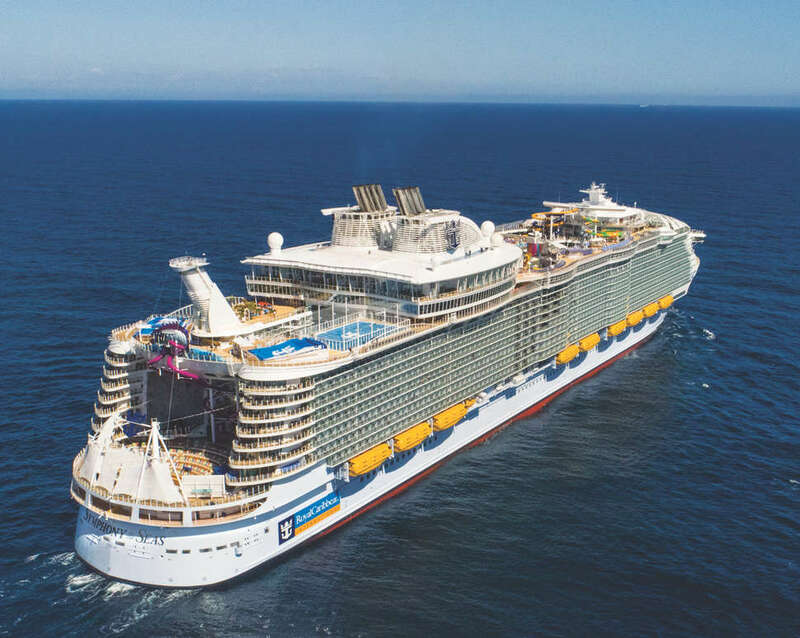 Now, two years after the epic Harmony of the Seas revolutionized what we expect out of a cruise ship, Symphony of the Seas takes that insanity and cranks it up a notch. 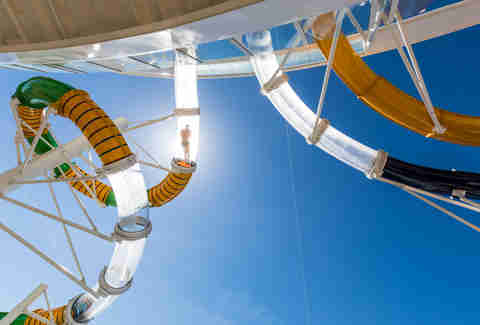 It’s 1,188 feet of pure entertainment and indulgence, topped with a trio of waterslides and an artificial surf-wave pool. Seriously, you’re going to feel like you’re 11 again. The trio of top-deck water slides are named The Perfect Storm, all of which whip you around through clear and colored tubes like anything at land-based water parks. Even if you quit going to water parks about the time you started worrying about what you looked like with your shirt off, you’ll get over it instantly here. Look around and you’ll see far-from-perfect adults are the ones in line. It sits across from two FlowRiders, surfing simulators that are a blast even if you’ve never tried to catch a wave. I wiped out every time I tried it and didn’t even garner a snicker from the crowds. A marked improvement, actually, from being a kid. Much like Harmony, Symphony of the Seas’ aft decks are home to the 10-story, 150-foot Ultimate Abyss dry slide, where you speed down the mouth of an anglerfish through bright flashing lights at 9 feet per second. If you’re even a little afraid of heights, consider this immersion therapy. You’ll climb to the top of the ship’s 16th deck, then ascend another set of stairs to a glass-floored platform, then stare 10 stories down into a pool, before gazing out at the ocean. Then, you take the plunge. The food on this ship had me researching intermittent fasting the entire flight home after eating my body weight in steak, seafood, and smoking eggs. 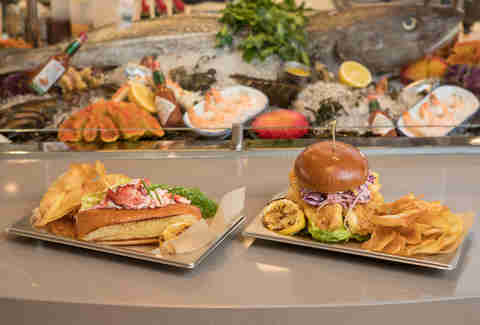 In addition to bringing back Harmony’s hits like Chops Steakhouse, Izumi Sushi and Hibachi, and Jamie Oliver’s Italian restaurant, they’ve added a fast-casual spot called El Loco Fresh, located conveniently next to the basketball court for the closest thing you’ll find to Venice Beach on a cruise ship. There’s also Playmakers, a sports bar serving up solid beef sliders and chicken wings alongside other bar favorites. Most importantly it has 30 flat screens showing a grab-bag of different sports from around the world. I found myself making friends with people from other countries, as a short comment about a certain English footballer’s penchant for dirty play led to a 20-minute discussion with a pair of lubed-up Brits. The star newcomer is Hooked, a fresh seafood restaurant set atop the ship’s 17th floor. It boasts a clean beach-house décor and a menu long on fresh seafood from wherever the ship happens to be homeported. The standout here is the lobster roll, which was the talk of the culinary crowd on the short preview cruise I attended. The rich, buttery roll is on par with any I’d had covering restaurants at home in Miami. But everyone, I promise, is still talking about Wonderland. The Lewis-Carroll-inspired restaurant has you enter through a long rabbit hole, open a doorway in the middle of the bar, and descend down red-velvet stairs into an alternate reality. Here a server dressed as the Mad Hatter hops from table to table, quipping with guests. The menus are written in invisible ink, and readable only when painted with water. Entrees are flashbacks to childhood basics with adult spins. Like the deconstructed tomato, reconstructed with Bloody Mary and olive spheres. Or the deviled eggs served on a smoking dish atop phyllo strings, capturing the flavor of a campfire. Pro tip: Don’t go see the Aqua Nation show after gorging yourself at the specialty restaurants. I went from happy fifth grader to insecure seventh grader as soon as the team of Olympic divers and synchronized swimmers came onstage at the Aqua Theatre. Their show of triple-flips off a 68-foot diving board and synchronized group dives over swimmers in the pool below was astounding. But the thing about divers, they don’t look like they’ve spent much time at buffets. I vowed to curb my eating as soon as the show was over. There’s also an original production of Hairspray, which aside from casting a size 4 to sing “Big, Blonde, and Beautiful” is a national tour-level production. There’s also Flight, a historical satire on the history of aviation. Plus the requisite comedians, jazz combos, and live bands that make sure you’re never lacking for something to do. If you REALLY want to feel like a kid again, splurge for the Ultimate Family Suite, which comes with a private Genie, who will likely not call you “master” and wear an overly-revealing two-piece outfit, but will make sure you have everything you need when you need it. The suite also comes with a slide that goes directly from one of the bedrooms down into the living room, a wraparound balcony, and a TV room with a popcorn machine and every video game system ever invented. So you can spend your entire vacation playing Blades of Steel, if that’s what you’re into. The ship isn’t without its kinks. If you’re hellbent on getting your gym on you’ll find the fitness center conveniently located above the casino. Which means the smoke wafts up into the cardio area, making it a little like working out in an old rental car. The Bionic Bar -- where automated arms make drinks from bottles hanging from the ceiling -- is cool in theory but shuts down when some bottles run out, and if you were sitting in the drink queue, it will occasionally tell you to start over. The Rising Tide bar -- a watering hole on an elevator that goes from the promenade shopping level to the outdoor Central Park -- moves painfully slowly, though apparently moving faster would legally require seatbelts. Of course, if the worst you can say about a cruise ship is its high-tech bars can be slow and the gym smells weird, you’ve got yourself a first-rate vacation. Sound like the perfect way to spend a week at sea? Symphony’s sailing out of Barcelona around the Mediterranean all summer, with stops in Mallorca, Italy, and Marseille. Those trips start at around $1,800 for the week. Wait until November and it’ll be a little closer, sailing the Caribbean out of Miami with inside cabins starting at about $750. Cheaper and easier, if less exotic. If you have the scratch, Symphony of the Seas is pretty phat ride -- the most impressive, technologically advanced, and flat-out fun cruise ship to ever hit the ocean, and if you’ve never been on a big, floating city this should absolutely be your first. Even the days at sea are entertaining, and a week here will seem like a blur of slides, incredible entrees, and Broadway shows. You’re only young twice, after all. Matt Meltzer is a contributing writer to Thrillist who could eat every meal of his life at Wonderland. Follow him on Instagram @meltrez1.